The ability of lanthanoids to inhibit calcium pumps has been well studied and is now widely used in experimental biology. It is also the basis of the staining method described here. 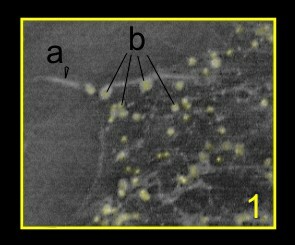 First attempts in this field had been made long before scanning microscopes became capable of operating in a low vacuum mode [Doggenweiler CF, Frenk S Staining properties of lanthanum on cell membranes. Proc NatI Acad Sci USA 3:425, 1965] and therefore didn’t yield much success. 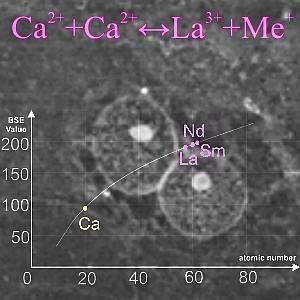 The major mechanism of sample-stain interaction can be summed up as follows: once involved in cell metabolism, a trivalent lanthanide ion can co-operate with an alkali metal ion in replacing two Ca2+ ions transported together, thus causing the pump to seize. This results in a two-fold increase in brightness of calcium pumps in BSE-images. Moreover, lanthanoids have demonstrated an extraordinary affinity to cadherin-like proteins and phosphorus residues of GTP hydrolysis, which ensures high visibility of intercellular contacts and intracellular cytoskeleton, respectively. We have also noticed something interesting while working with cell cultures and small biological samples: after being Ln-stained they practically stop losing water and retain their natural shape even at high vacuum. Within the next few hours we observe neither sample contraction, nor surface cracks, nor any other possible artifacts! Why this occurs is not entirely clear. We can suppose that, with most of cellular transport systems inhibited by lanthanoids, membranes’ permeability decreases and static potentials are generated on protein molecules preventing structured water from leaving the cell. Thus, lanthanoids can rightly be regarded as a gentle contrast agent able to make the process of visualization easier and more practical. We have significantly modified the previous Ln-staining method so that it could meet the requirements of modern technologies. For your convenience, we have also made up an easy-to-use reagent kit. What objects can it be applied to? Supravital lanthanoid staining method is quite universal. 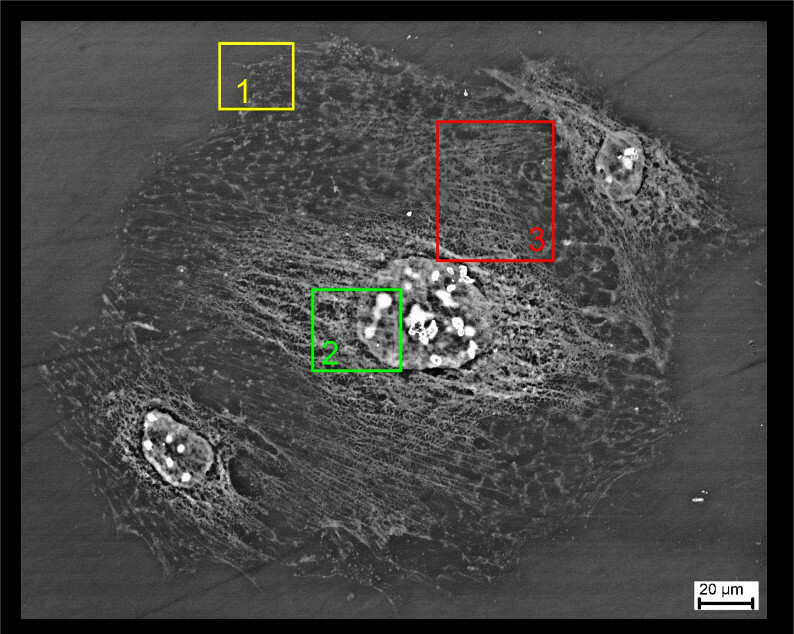 In our experience, it performs particularly well in visualization of intercellular contacts, intracellular cytoskeleton, and nuclear membrane of human epithelial cells as well as surface topography in Coelenterata. 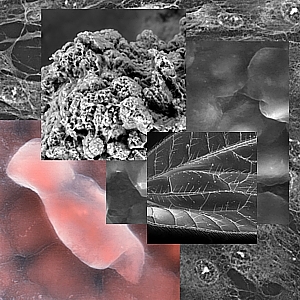 The optimal object of observation would be a monolayer cell culture on tissue culture plastic or a tissue-engineered structure, such as cell-seeded carbon matrix. What objects can it NOT be applied to**? Supravital lanthanoid staining, as the name implies, cannot be used on fixed tissue blocks. 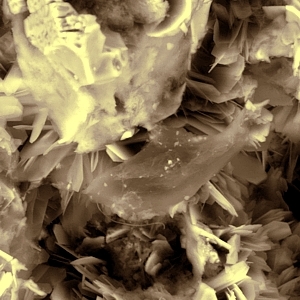 Moreover, due to aggressive substitution in calcium phosphates, lanthanoids are not recommended for studying bones or any cells cultured on phosphate substrates. **You will probably come across some other objects that are unamenable to Ln-staining as you do your project. Please keep us informed! a. Thin cytoplasmic outgrowths, delineated with bright cell membrane. b. Rounded mitochondria (at higher magnification they appear unevenly stained because of the folds of the cristae). a. Cell membrane and karyoplasm are generally brighter than the cytosol. Within the nucleus one can see even brighter nucleoli of various shapes. 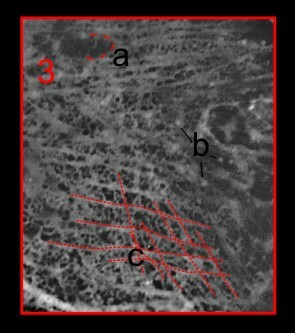 All cell structures in the image are overlaid by cisternae of the endoplasmic reticulum (ER). 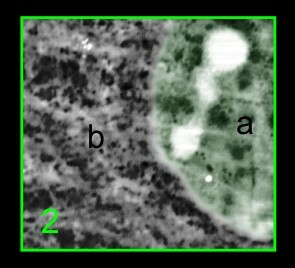 b. Interconnected ER and Golgi cisternae surrounding the nucleus. a. 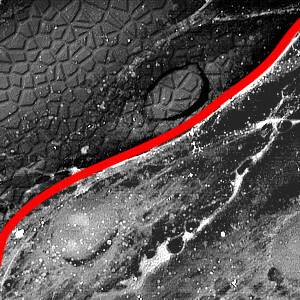 Clearly demarcated rounded ‘hollows’ indicate the location of lysosomes. b. Cytoplasmic organelles include some mitochondria that are often spatially associated with the cytoskeleton. c. Extended structures correspond to the cytoskeleton (are traced with red dotted lines).